There is a news of big hope from Hinduja Hospital. 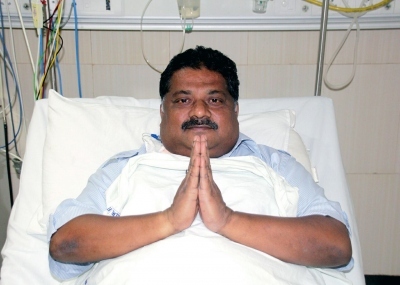 Deputy Speaker Vishnu Wagh is off ventilator from today. He has started breathing on his own, without life support. This was told to goanews.com by Raja Khedekar, vice chairman of Kala Academy. "I spoke to the Hinduja doctors. They told me his ventilator has been removed from today. His condition is now stable", Khedekar said. He however also said that doctors have told him that Wagh would take time to recover fully. Yesterday, Wagh had responded with a smile when Dr P S Ramani had told the St Andre MLA that Chief Minister had come to see him. CM Laxmikant Parsekar had visited Hinduja hospital yesterday, accompanied by Dr Ramani, Goa-based nationally renowned neurosurgeon. In a mobile message sent to Dr Ramdas Naik from Goa, he had said that Wagh's condition is improving day by day. After receiving massive attack on 15thAugust, the artist-turned-politician has been presently treated at Hinduja Hospital in Mumbai. He was shifted to Mumbai on 18thAugust in a critical condition from GMC hospital as his heart had stopped functioning for almost eight minutes (revived later), causing damage to his brain.